Despite some high-profile hesitation surrounding artificial intelligence, robots generally seem to be on our side for now. But there's at least one recent exception to that trend. As Fast Company reports, Alexander Reben's "First Law" robot may be the first of its kind designed with the sole purpose of inflicting pain on humans. The robot's name is a reference to the 1942 Isaac Asimov short story "Runaround" which contains the three rules of robotics. The first reads, "a robot may not injure a human being or, through inaction, allow a human being to come to harm." The robot created by Reben—an artist, engineer, and roboticist from Berkeley, California—was built to do the opposite, but it stays true to Asimov's original theme: the potential complications of artificial intelligence. The bodily harm the machine doles out comes in the form of a swift needle prick to the finger. What's even more unsettling about the robot is that it doesn't inflict pain at every opportunity. The device will sometimes refrain from pricking its victim in order to avoid getting switched off. So effectively, the robot chooses its victims autonomously. The First Law robot wasn't built for any practical purpose, but rather to serve as a catalyst for discussions about the future of AI. Many of the world's leading technology experts, including Stephen Hawking, have warned of the dangers of allowing artificial intelligence technology to progress unchecked. Reben hopes that lawyers, philosophers, and engineers will catch wind of the project and join in the conversation. "These cross-disciplinary people need to come together, to solve some of these problems that no one of them can wrap their heads around or solve completely," Reben told Fast Company. 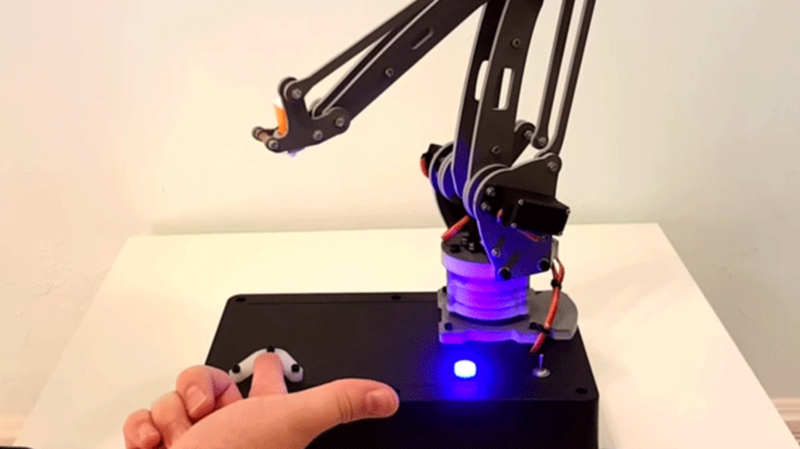 Watch a clip of the pain-inflicting robot below, then ask yourself if you would trust it with your finger's well-being.